Available for Fall 2012 classes.Authors Philip R. Kesten and David L. Tauck take a fresh and innovative approach to the university physics (calculus-based) course. They combine their experience teaching physics (Kesten) and biology (Tauck) to create a text that engages students by using biological and medical applications and examples to illustrate key concepts. University Physics for the Physical and Life Sciences teaches the fundamentals of introductory physics, while weaving in formative physiology, biomedical, and life science topics to help students connect physics to living systems. The authors help life science and pre-med students develop a deeper appreciation for why physics is important to their future work and daily lives. 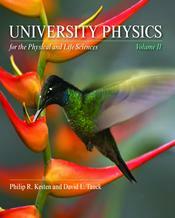 With its thorough coverage of concepts and problem-solving strategies, University Physics for the Physical and Life Sciences can also be used as a novel approach to teaching physics to engineers and scientists or for a more rigorous approach to teaching the college physics (algebra-based) course.University Physics for the Physical and Life Sciences utilizes six key features to help students learn the principle concepts of university physics:• A seamless blend of physics and physiology with interesting examples of physics in students’ lives, • A strong focus on developing problem-solving skills (Set Up, Solve, and Reflect problem-solving strategy),• Conceptual questions (Got the Concept) built into the flow of the text,• “Estimate It!” problems that allow students to practice important estimation skills• Special attention to common misconceptions that often plague students, and • Detailed artwork designed to promote visual learningVolume I: 1-4292-0493-1Volume II: 1-4292-8982-1For more information about Volume 2, click here.